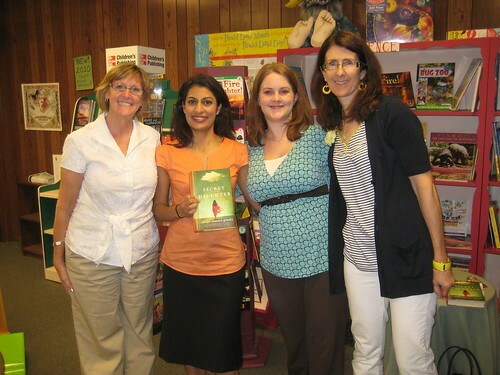 Shilpi Gowda was kind enough to stop by The Bookstore in Glen Ellyn last Friday night for happy hour to talk about her debut book, “Secret Daughter” (my review). After reading an absolutely gut-wrenching scene from the book, Shilpi talked a bit about her experiences leading up to writing the book, her writing process, and her time volunteering in an orphanage in India. She was absolutely lovely, and it was fascinating to see how her experiences influenced the book she wrote. Another thing that was very interesting is hearing how her book is doing in the US vs. Canada (in both places it is published by HarperCollins). In the US it is doing respectably and is on a second print run, but in Canada she’s on an 8th printing and has great placement in airport bookstores and in Costco. Even Shilpi didn’t exactly have an explanation for that, but it is interesting. My Canadian friends, have you been seeing “Secret Daughter” everywhere you turn? Ooh. It’s been way too long since I’ve been to a book event. This sounds like a fun night. How super you were able to go to this great event. I have been wanting to read Secret Daughter for a while. Oh it’s nice to see some familiar faces Sounds like you had a great chat. interesting–I wonder if costco in canada does more hardcovers? here i could see this going in there in paperback. What fun to see Margie and Sue after following them on Twitter and the blog! I have a feeling that “Secret Daughter” is going to get bigger in the U.S. – it’s really getting great reviews on blogs. Wow! I would have loved to meet her! Secret Daughter is a book that’s high up on my TBR!